The most common solution to this was to increase bounce values, which I have done. I have also tried flipping and recalculating faces and tried different lights. The only closest material I can make to a glass is by using a transparent shader with a glossy one, but its result isn't satisfactory. The environment is set to black background, and setting it to any other colour just introduces reflection of that colour on upper half of the sphere. The culprit was "AO Bounce" setting. I had seen a Blender Guru tutorial which mentioned that for reducing render times, and had no idea it would have that effect on glass materials. Setting it to 0 fixed the issue. For now I have this setup, but it can use slightly more fresnel effect. Idk if this is the result you're looking for but this is the material I use. Not the answer you're looking for? 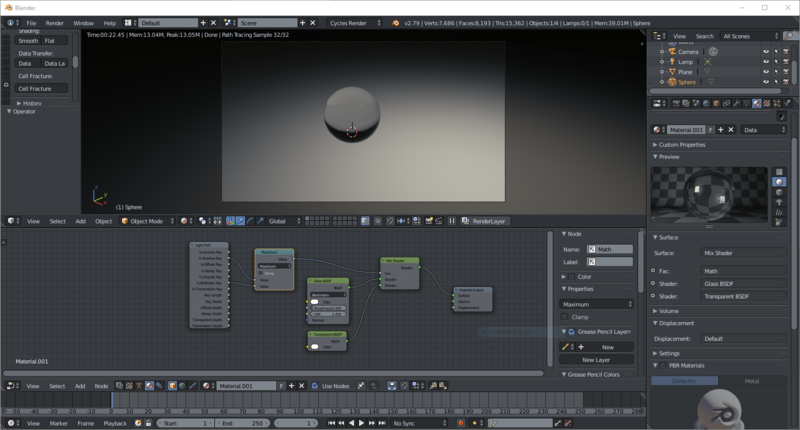 Browse other questions tagged cycles rendering materials shaders glass . How can I create a water material in Cycles? How can i make my material look like more like a crystal glass?